People who know me best know that I try very hard not to be a killjoy. I’ll crank up the Manilow and cruise the block (at a reasonable speed) with the best of ‘em; I’ll start a game of charades to get the party started anytime, anyplace; heck, I’ll even do the wave at a sporting event, provided that I am in a position to do so — nothing in my lap or in my hand, no leg cramping, shoulder soreness, problem perspiration, etc. 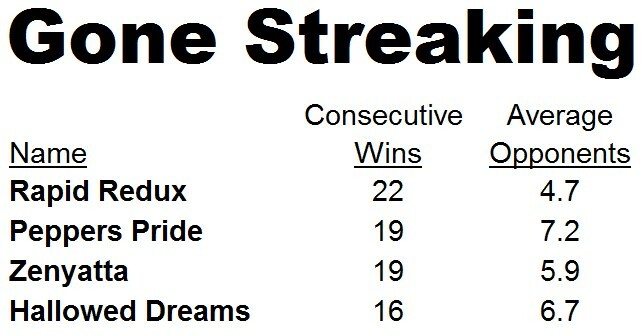 * Victories at nine different tracks, including Laurel and Gulfstream Park. * Wins at distances ranging from 4 ½ furlongs to 1-1/8 miles. * 33 starts in 2010-11. No, it’s the way the horse has been handled in recent starts that has me troubled. Unfortunately, I think Rapid Redux’s win streak has become the primary focus of far too many and everything the horse stands for — at least to me — has gotten lost in the proverbial shuffle. Rapid Redux is a blue-collar, bring-your-lunch-box-and-steel-toed-boots-to-work kind of horse… the poor man’s version of Seabiscuit. He is not Zenyatta or even Hallowed Dreams or Peppers Pride. Although Peppers Pride faced solely New Mexico-breds in running up a 19-0 lifetime record, she never descended to the claiming ranks. Hallowed Dreams, who won 25 of 30 career starts, competed primarily in ungraded stakes affairs. And, of course, we’re all aware of Zenyatta’s resume. Yet, while all of those horses got criticized — routinely — for “ducking” stiffer competition, Rapid Redux has been generally praised for his win streak, despite some troubling issues associated with it. 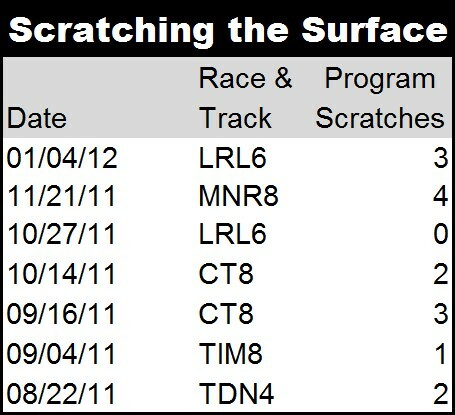 To begin with, in the six-year-old gelding’s last five trips to post, there have been — count ‘em — 12 program scratches. In fact, following the late defection of trainer Scooter Davis’ highly-regarded entry of Disco Indy and Valid Venture prior to Rapid Redux’s 18th win in a row at Charles Town on Oct. 14, an investigation was launched regarding rumors that Davis had planned on withdrawing his talented duo all along. According to Davis, he had van trouble, which prevented him from transporting the horses from their home track of Mountaineer Park. 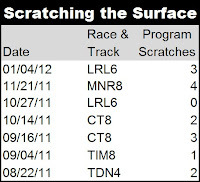 OK, fine, so what was the problem on Nov. 21, when Disco Indy scratched once again… at Mountaineer Park? Rapid Redux bested three opponents in a $5,000 starter event that day; Disco Indy shipped to Charles Town nine days later and dusted a field of $12,500 optional claimers. Not surprisingly, as a result of these scratches, not to mention a lack of qualified contenders in the cheap starter allowance/handicap ranks, Rapid Redux has faced an average of just 4.7 opponents during his 22-race winning skein. Still, it’s not the lack of competition that bothers me. What’s kept me off the Rapid Redux bandwagon is the ridiculous emphasis that has been placed on his winning streak. The fact is no one outside of Charlie Sheen wins all the time, especially the blue-collar champions we’ve come to know and embrace. Seabiscuit lost the first 17 races of his career; Stymie lost his first 13, including eight for a tag; Rocky Balboa lost his battle with diction… the list goes on. Blue-collar heroes don’t win all the time. They win when the going gets tough, against impossible odds. They win with grit; they win with heart. When Kirk Gibson of the Los Angeles Dodgers stepped to the plate in the bottom of the ninth inning to face the Oakland A’s star reliever Dennis Eckersly in the first game of the 1988 World Series, his MVP season was all but a memory. Battling a stomach virus and injuries to both legs, Gibson had batted just .154 in the National League Championship Series against the New York Mets and didn’t even figure to play against Oakland. Legendary announcer Vin Scully described Gibson’s appearance at the plate. With the count full at 3-2, Gibson appeared to almost lunge at Eckersley’s next offering, a backdoor slider — and he deposited it over the right-field fence. That, my friends, is what blue-collar heroes do. They don’t look for gimmes and handouts; they don’t ask for every advantage in the book. They win at their best, and they win at their worst. The Dubai Carnival, which culminates with the $10 million World Cup on March 31, has begun. Contested at Meydan Racecourse, the Carnival features top-grade turf and all-weather action. To get your Win Factor Report for Friday’s races, click HERE. *Includes Pace Profile Reports for races 3 & 8. I care about the horse. Is the plan to just keep running this brave, little animal until he breaks down??? Kathi, contrary to popular opinion, racehorses, for the most part, are very well cared for. Thoroughbreds love to run and there is nothing wrong with having them race. Could he break down? Sure. But he could break down on some retirement farm as well. And, if he were a wild horse, he would face even greater challenges. If you get the chance, tour the backstretch of a racetrack or talk to some of the racing fans on my Facebook page. I think you might be surprised by the love they have for the horses involved in the Sport of Kings.